Lumière Residences and Fraser Suites are separate towers, together forming the ‘Regent Place’ development. Lumière is the taller and more prominently positioned, so has a more ‘landmark’ quality (water feature and the see-thru swimming pool over the foyer). Fraser Suites is not as tall and situated behind Lumière when viewed from main street (George Street). Lumière is the main of two towers that form the Regent Place Development on the site of the former Regent Theatre adjacent to Sydney Town Hall. Lumière comprises 447 residential apartments in a 41 storey tower building with a mix of studio, one bedroom, two bedroom, three bedroom, and exclusive penthouse apartments. Extensive private residents’ recreation facilities are located at the top of the 4 level sandstone and glass podium and include a 50m pool, spa and sauna, gymnasium, theatrettes, and a multi-function facility. A private secure entry lobby is provided off Bathurst Street with uninterrupted views of the historic Town Hall precinct opposite. Private resident car-parking is provided in the eight level parking and service facility under the site. Regent Place is located in the heart of Sydney’s historic Town Hall precinct on George and Bathurst Streets, comprising two soaring glass towers linked by a sandstone-wrapped retail/commercial podium. Designed by Foster + Partners with documentation by PTW Architects, Regent Place is notable for being Foster + Partners’ world-first high-rise residential building. 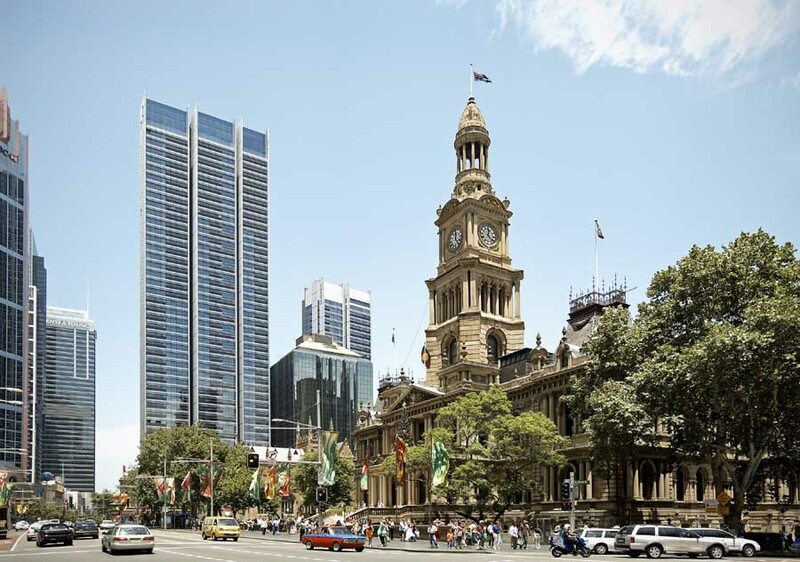 In appointing Foster + Partners Frasers Property rewarded the significance of this prominent and historic site with globally significant architecture, a natural result of Frasers’ international outlook. Regent Place comprises Fraser Suites Sydney, a 201key all-suites hotel addressed from Kent Street, and Lumière Residences, a luxurious residential tower. A common basement and podium provides parking, three levels of retail space and one level of commercial space. Regent Place redefines 21st century living, as a contemporary vertical village. Lumière Residences rises to 56 levels, delivering a collection of 456 light-filled apartments including 8 three storey Sky Penthouses. Private residential facilities extend across two levels, including a 50 metre heated swimming pool and adjoining 20 metre recreation pool, large gymnasium, theatrettes, spa, sauna and steam room, lounges and terraces. A 24 hour Concierge is based in the dramatic black and red Bathurst Street foyer, featuring bespoke illuminated water feature and sculpture. The 42-level Fraser Suites tower consists of a cluster of three tall, slender volumes supported by a central core. Fraser Suites Sydney houses a mix of high quality fully serviced studio, one, two and three bedroom apartments that include duplex penthouse suites. The recessed façade allow daylight into the heart of the tower and provides at each lobby level framed views of the surrounding city precinct. The traditional open suite balconies have been integrated within the metal and glass vertical façade to create loggia that moderate the climate to provide year-round use while preserving a flush and seamless contemporary appearance in harmony with the neighbouring commercial buildings. At night, the slender form and the illuminated recesses of the building becomes a striking dynamic light sculpture, set against the city skyline. Fraser Suites Sydney provides a designer contemporary all-suite serviced residence with all of the associated private services and facilities. Main entry lobby, pool, gym and a business centre all provide a modern friendly experience where residents can live, work as well as spend their leisure time in a ‘home away from home’ atmosphere. The main 48-storey residential tower, Lumière, consists of a cluster of eight tall, slender volumes supported by a central core. Lumière houses a mix of high quality studio, one, two and three bedroom apartments that include duplex and penthouse apartments to provide a highly diverse village of accommodation. The façade recesses penetrate deep into the building and allow daylight right into the heart of the tower and provides at each lobby framed views of the surrounding city precinct. The traditional open residential balconies have been integrated within the metal and glass vertical façade to create loggia that moderate the climate to provide year round use while preserving a flush and seamless contemporary appearance in harmony with the neighbouring commercial buildings. Within the Lumière residential building the main entrance, pool and apartment common spaces provide a dynamic experiences where residents can live as well as spend their leisure time. Each space is designed with a unique visual experience starting from the contrasting sculptural water feature, to the sleek, vertical lines of the finishes in the entrance lobby. At night, these striking elements become a dynamic light sculpture, set against the city skyline. The entrance lobby is a triple height space opening onto Bathurst Street opposite the historic St Andrews cathedral. The scale of this dramatic space has been conceived to relate to these neighbouring landmarks, and the transparency of the entrance ensures good views to the cathedral, with a strong relationship between the private world of the tower and its urban context. A flush three-storey-high glass wall divides the entrance lobby between exterior and interior, reflecting the cathedral. A sculptural water feature marks the entrance, enlivening the way the building meets the ground, and providing a buffer between the lobby and the street. Custom designed, it contrasts the sleek, vertical lines in the main entrance lobby. It has been designed to create noise through water coursing over the stepped sequence, minimising the perceived noise from the street. At night, this element becomes a dynamic light sculpture, set against the bright scarlet rear wall. On entering the lobby a vast 7x3m acrylic window in the underside of the 50m swimming pool above allows filtered dappled sunlight shafts to penetrate the space. It also offers views up to the swimmers and views down to the water feature from the swimming pool. The colour palette is dark and highly reflective – like the surface of a grand piano – with polished granite black floor of 1.2m x 6m paviours and black tinted mirror. These have an arresting, vibrant quality because of the constant play of reflecting light and images. The reception desk and mail box area are integrated into a dramatic, continuously curving organic polished black form. Turning away from the main entrance into the lift lobby, the finishes change completely into a hall of mirrors that rise 8m high. Above each lift door flush glowing white panels run to the ceiling and are reflected within the mirrors. The design of the lift car continues the complex of reflections by using black glass, glowing poly-lite side wall panels and a polished stainless steel ceiling. In addition to being aesthetically beautiful, these are also hard wearing, highly functional materials. The brief was to create a vertical village – a place where residents can live as well as spend their leisure time. The client specified a 50m long pool as the centrepiece to the residential recreation levels. Owing to site constraints the pool runs north to south from the interior and out onto an external landscaped roof terrace containing a hot tub with views over the cathedral and town hall. The end of the pool has the aquarium acrylic panel, establishing a visual link to the main lobby below and allows filtered dappled sunlight shafts to penetrate the space below. It also offers views up to the swimmers and views down to the water feature from the swimming pool. Above the main pool there is a large mirror panel internally running along its length and the floor finishes are grey granite. Four giant ‘v’ columns transfer the load of the tower above through the swimming pool below, which was one of the main construction and acoustic challenges for the project. The columns contain seating areas and access to a smaller internal pool area beyond. Within the pool area, there is also a sauna and steam room. Associated with the pool there are 2 levels of recreational areas including a gym, studio spaces, and two small theatres for social events. The Lumière tower is ‘H’ in plan, the furthest tips of the apartment lobby corridors have windows to let in natural light and to allow for natural ventilation at certain times of the year. The window ‘cuts’ into the tower run the full height of the Tower and through the podium, dividing the building into blocks. In the podium this mirrors the scale of the historic sandstone buildings and in the towers it allows natural light and ventilation inside. The towers are designed to be more modern in appearance, with a silver and glass palette. The cuts are accentuated at night by blue lights at the end of each corridor which tie into the overall lighting concept. The reflective, dark material palette continues in the apartment lobbies, with the same black polished panels from the main lobby. A vibrant blue striped carpet, custom designed creates a distinct feel for each apartment corridor off the lobby. The doors to the apartments are gloss black with a custom light above each entranceway. Again this ties in with lighting concept, creating a sense of the lobby as a street, punctuated with a series of street lights creating a pool of light outside each dwelling.